From the beginning of recorded time, the Provost and officials of Scottish burghs have walked the burgh boundary once a year, checking that the march stones are in place and that, there are no illegal encroachments on burgh land. In the border towns, and Linlithgow and Edinburgh, the marches are checked by people on horseback in the annual common ridings. 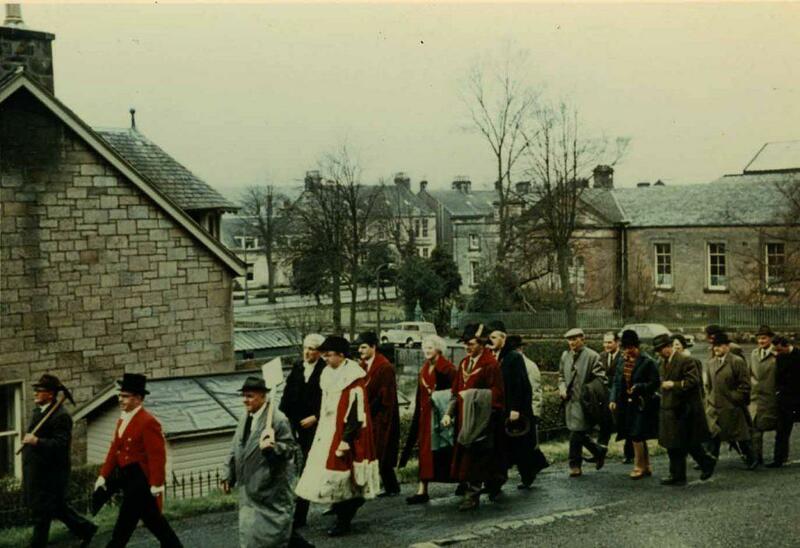 This photograph shows a Stirling Walk, headed by the Provost in his Robes of Office in the 1960s. In the period 1950-2000, walks were relatively rare. In 1737 there was a complaint that too much money was being spent on the annual dinner for the magistrates and Dean of Guild after the march, but this was over-ruled. The march stones were supplied by those who became burgesses, and in 1723, all of the stones were numbered, so that a count could be kept. The municipal party in this photograph is walking along the lower Back Walk, now known as Greenwood Avenue. This area from the path to the Town Wall, has been professionally cleaned and cleared by volunteer Roman Solochenko, who comes from Russia. He has made a magnificent gift to Stirling, and the area is again a beauty spot for all to enjoy.